NetApp used its Insight 2015 conference to put intense focus on its concept of the data fabric. The storage vendor believes that in light of the Big Data explosion and the need for multiple Clouds going forward, there is a huge opportunity for partners to capitalise on. 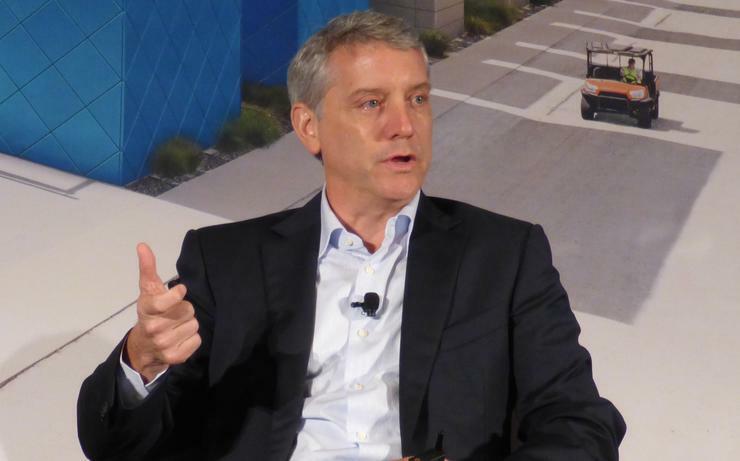 NetApp president Asia Pacific, Rick Scurfield, explained that the vendor is trying to make sure that partners both understand and are able to change the conversations they are having with customers so that they have the shifting data landscape in mind as they are looking at options. NetApp vice president worldwide channels, Bill Lipsin, added that the company had done a lot of work, and had more to do, on helping partners educate their customers on what the Cloud can actually do for them. “People think the Cloud could be the panacea, but what we are saying to our channel partners is they have to embrace the Cloud, do not fight it, but understand where it fits and how our technology can help you and your customers get there,” he said. “The other part of that is, Mr channel partner, not only do you need to understand the Cloud, but then you need to make sure that you are building offerings and services so that you can help the customers get there. “When you look at the [partner] programs and the enablement we are investing in, it’s about how do we educate them , how do you arm them so that they can become self sufficient. So we are going to build those services and act as a [data and technology] services organisation for those channel partners until they can get themselves up to speed. Once they are self sustaining, we will pull out and do something else. “The perfect channel partner is one that has a clear understanding of what the assets are that are out there, how their customers work and then they start to marry that using the NetApp technology. Lipsin added that the company’s research has given it a good deal of insight into what makes a profitable channel partner. “Partners that have invested in services whether it is professional services or managed service capability, even some level of Cloud services, they’re the most profitable,” he said. Scurfield added that for the Asia-Pacific region, there was not a one size fits all policy due to market differences in maturity and infrastructure. “The reason that Australia was able to be a leader in that whole Cloud movement is that they have the infrastructure, the capabilities, the thought process and the technology to take advantage of what the Cloud is promising. Scurfield also touched on the price point, noting that even though companies like Amazon were driving the price point down, there was a convergence of the amount of capacity and the amount of data being generated, but that the price points were still not beneficial to the customer. “That’s something you have to watch out for, whenever new technologies come around, there is always a premium paid before the cost curves go down.What we are seeing a lot of now is that Cloud companies are managing internal [locally based] Clouds, eventually those will move stuff to external Clouds," he said. Scurfield explained that this was also dependent on what the respective government policies are in each region, regulations on moving data and data sovereignty. “The way I am looking at it and the way I talk to the partners and customers about it is that it is an exercise in future proofing strategy. The data fabric is really about how do you future proof what might be there in the future. The vision is about seamlessly moving data between Amazon, Azure, Softlayer and Telstra or whatever local Cloud may come up," he said. “The conversations with the partners are, that’s a vision, the ability to execute that at a customer level is incredibly complicated,” said Scurfield. “Take the data fabric out of the equation, if you wanted to do a tech refresh and a migration from one network capability to another network, it’s a multi-year and architecturally challenging task." He highlighted that's where the opportunities will be for partners. "Don’t worry about the technology side, we’re going to help them to make sure that it’s there. Partners just need to worry about helping customers on their journey, we’re going to be there future proofing your strategy," he said. “If you are a channel partner, as you are trying to work through this whole transformation, you need to change your business model because revenues on the hardware side aren't like they used to be, so this is a nice safety net for them to not only help customers but to help their own business models." NetApp increased the amount of free certifications offered at Insight from one in 2014 to two this year. Scurfield told ARN that in APAC, 99 per cent of its business was through the channel. “There is no other option for me other than investing in those partnerships,” he added. “We have three categories of partners. There are the fulfilment partners that never ask for anything except when it is time to close a deal, they bring it to us and we help them close it. Then there is the value add and the incremental partners," he said. He explained that the latter two categories of partners are the ones that had been asking the vendor for help. “That investment is coming and will continue to increase into the partner community. Especially in APAC, not that I would choose another way, that’s where we will go because that is the only way we can virtualise the sales force," he said. “You can absolutely see the difference in the ones that have made the investment and the ones that we are co-investing with, those are the ones that are growing." NetApp recently appointed a new senior director of partner enablement, Eric Fusilero. Lipsin said the appointment was made, in part, to ascertain where the best place for those investments is within the channel. “It is such an important area for you to invest in you may see us ratchet back on other investments to make sure we put more into enablement,” Lipsin explained. “We need to change both the profile and the capabilities of our partners, and it’s not just technical, its also the sales side as well." Lipsin said distributors also needed to jump into offering services that won't compete with their partners. “At this point in the US and in Europe we are working with Avnet and Arrow to make sure that we are leveraging the investments they are making and the acquisitions they are making as well to have their services organisations compliment what we are doing and what the channel partners are doing as well. “We are working through the APAC strategy to work out which organisations are best suited for that as well. It is not a US only strategy, it really is going to be a global strategy. Scurfield added that process was more complex in Asia due to the difference in scale and breadth of organisations in the region. “I don’t have that common distributor that sits in China, Australia and Japan. You have to have a different strategy for each,” he added. Chris Player traveled to Insight 2015 as a guest of NetApp.